UPDATED: Mon., Feb. 11, 2019, 7:25 p.m. The Spokesman-Review’s Theo Lawson is one of 65 national media members voting in the Associated Press Top 25 basketball poll this season. Every week throughout the 2018-19 campaign, he’ll break down he voted, offering three thoughts on the latest edition of the poll, an update on the Pac-12’s ranked teams and a look at local Top 25 representative Gonzaga. 1. We said last week the Big Ten may be the most competitive conference in college basketball, but in terms of sheer quality, it’s likely nobody is topping the ACC. Round two of Duke versus Virginia gave us more affirmation on that front Saturday. The Blue Devils have the stars to compete for a national title and the Cavaliers have the stifling defense to do the same, even after a second loss to Duke. It’s a loaded conference beyond those two, however, and UVA’s battle with North Carolina this week could be just as good as the one between Duke and Louisville. 2. Gonzaga and Nevada have respectively cemented their places as the nation’s top mid-major teams, but there’s a third that’d probably like to have a say in that conversation, too. Former Washington State coach Kelvin Sampson and Houston have perhaps flown under the radar a bit this year, but the Cougars have just won their eighth game in a row, beating No. 25 Cincinnati 65-58. Houston slipped into the top 10 for the first time this season and probably won’t have another true challenge in AAC play until the regular-season finale at Cincy. 3. Kansas’ slow and steady decline lived to see another week. The Jayhawks have dropped at least one spot in six of the last eight weeks and they’ve gone nearly a full month without winning consecutive games, since beating Baylor and Texas back-to-back. After that it was loss, win, loss, loss, win, loss, win for Kansas. The Jayhawks and three other Big 12 teams are all tied for second place in the league standings, and there’s only a two-game gap between those three and first-place Kansas State. The Big 12 title is still within KU’s reach, but the Jayhawks sure don’t feel like a favorite at this point. Washington – For the Huskies, there wasn’t much room for error and this week’s poll only magnified that. Thirty-one voters placed UW in their poll last week, but that number dwindled to just six after the Huskies suffered their first Pac-12 loss, to Arizona State. Still, all five losses for UW have come to teams that were or currently are ranked in the Top 25. That’ll be significant in March if the Huskies don’t get the Pac-12’s automatic NCAA Tournament bid. Granted, if they want to do that, they can probably suffer only one or two more losses along the way. 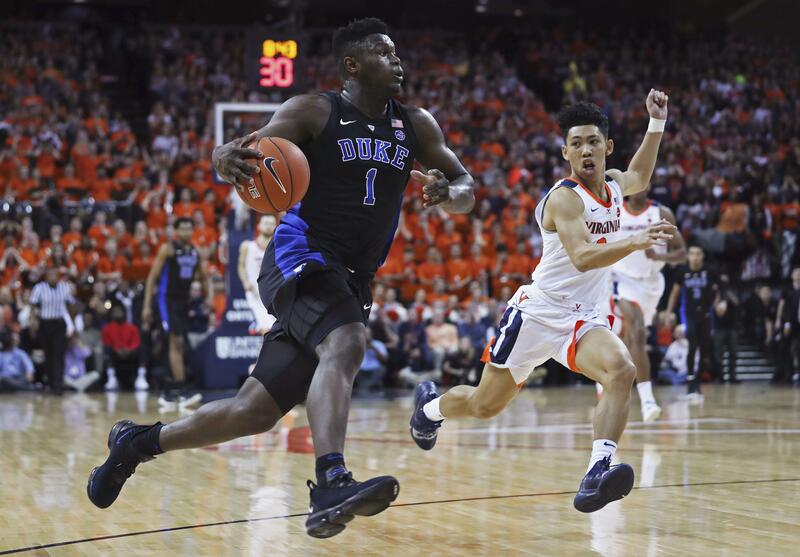 Whether it was Duke beating Virginia or Virginia beating Duke, Gonzaga was going to be the one benefitting from either the Blue Devils or Cavaliers losing Saturday’s high-stakes ACC matchup. The Bulldogs climbed in the Top 25 poll for the first time since Jan. 14 and now have their highest position in the rankings since being No. 1 in early December. Seven voters have GU ranked No. 2 and nobody has the Bulldogs lower than No. 5. That and another crushing WCC sweep were the positives for GU this week. And on the flip side? Killian Tillie suffered another longterm injury that could put the Bulldogs in a bind once they start playing games of consequence. The good news is those games won’t happen for another month, which gives Mark Few and his staff more time to develop young forward Filip Petrusev, who’ll probably have to assume a more important role when the Big Dance comes around. Published: Feb. 11, 2019, 4:04 p.m. Updated: Feb. 11, 2019, 7:25 p.m.